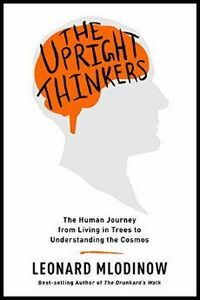 The Upright Thinkers: The Human Journey from Living in Trees to Understanding the Cosmos. Leonard Mlodinow. Pantheon. 2015. The California Institute of Technology physicist and bestselling author, Leonard Mlodinow, offers readers a grand history of science in The Upright Thinkers: The Human Journey from Living in Trees to Understanding the Cosmos. Spanning more than three million years, Mlodinow’s account of how humans come to ask questions about the physical world and the meaning of their own existence is a witty, entertaining read about the development of scientific thought and process. His explanations are clear, even when they concern some of the most puzzling developments in quantum mechanics. In short, it is a concise and engaging introduction to the history of science and to history’s most important scientific developments. Long overarching histories sometimes risk overlooking complexities, smoothing over contradictions and disputes. The Upright Thinkers embraces them, skillfully showing that the progress of science depends as much on happenstance, culture and institutional backing as it does on the passion and persistence of its main cast of scientist characters. Although the book recounts the stories of already well-known figures in science, such as Galileo Galilei, Issac Newton and Albert Einstein, their profiles offer rare glimpses into the social contexts of the scientists, their tribulations and their shortcomings. ‘[T]he vision of the great discoverers of intellectual history is more often muddled than clear’, writes Mlodinow, ‘and their accomplishments more indebted to their friends and colleagues – and luck – than the legends show and than the discoverers themselves often wish to admit’ (107-08). For example, in the chapter on Newton, Mlodinow brings our attention to the rigid class hierarchies at Cambridge, whilst highlighting Newton’s tendency to work alone. These aspects of a person’s life, Mlodinow maintains throughout the book, are important as they show that scientific developments do not occur at a stroke of genius. The apple falling on Newton’s head is apocryphal; rather, it was several years of work and failure, sometimes in isolation as Newton had preferred, along with coincidental meetings with other scientists and mathematicians, that led to the formulation of Newton’s laws of motion. Mlodinow makes this point clear: ‘progress required many hits on the head, and many years in which to process […] ideas and come to a true understanding of their potential’ (122). The figures in the book are often motivated by a curiosity to understand how the physical world works and their place in it. It is this trait, in Mlodinow’s view, that makes human beings distinct as a species. But this capacity to ask questions and think is constantly being shaped by the incoherence, unpredictability and grace of the human subject. As is the case with Newton, beliefs and feelings animate these figures as much as their mathematical or lab expertise. Human subjectivity, including that of Mlodinow’s, features importantly in the book. He deftly illustrates its crucial role with personal anecdotes of his own encounters with physics and with physicists, some of whom would give Newton a run for his money in terms of temperament. Mlodinow’s personal anecdote of Werner Heisenberg specifically and sensitively captures the complex relationship between science, ethics and politics. Mlodinow, a theoretical physicist himself, describes the ingenuity with which Heisenberg tried to represent the position of electrons in an atom with an infinite matrix, and later the uncertainty principle, which went on to seal the validity of quantum theory. Despite Heisenberg’s contributions to physics, Mlodinow felt unable to attend a lecture given by the physicist at Harvard University in 1973, on account of Heisenberg’s tacit support for the Nazi regime. In addition to these colourful accounts of the author’s own experience, the book pays detailed attention to the systems and technologies that played a role in facilitating scientific developments. For Newton, it was the recent availability of paper that enabled him to scribble copious notes into a notebook, which he called the ‘Waste Book’. This process was eventually integral to Newton’s formulations of calculus. Charles Darwin, renowned for his contributions to the theory of evolution, relied on the efficient ‘penny post’ system to share his ideas with colleagues and to gather feedback for what eventually became the manuscript for On the Origin of Species (1859), the first detailed account of natural selection. This attention to the material contexts – such as the development of glass lenses, changes to the postal system or the availability of specific metals – that limited or enabled certain scientific developments makes for a nuanced account of how scientific thought has progressed. It challenges a conventional view that science is a product of pure genius and hard work, whilst embracing the (quantum) randomness through which discoveries are made. Alongside Newton, Heisenberg and Darwin stood friends and family members, stationery, academic gowns, religious institutions and communication systems, all of which played interesting and crucial roles in providing the environments in which scientists and innovators thought. But this broad embrace of the scientific enterprise as an assemblage of technical, intellectual and cultural systems and objects points towards a shortcoming in the book. Throughout The Upright Thinkers, science is assumed to be a well-defined discipline of knowledge-making, represented by the branches of physics, chemistry and biology. However, this has not always been true, and controversies such as those surrounding whether the field of psychology is a ‘science’ or not testify to the need for a more critical definition of science. Mlodinow’s concept of science seems to be accompanied by the values of skepticism, imaginative boldness and (often harsh) critique embodied variously by the protagonists in the story. A brief explanation of how science came to be defined as it is today and associated with rational thought would have been helpful. If we are to also pay attention to the various systems of belief and technologies that shape scientific developments, it should move us to ask where the boundaries between science and non-science are drawn, and why the former should be the domain of rational thinking. Nevertheless, Mlodinow’s attempt to recast scientific discovery in a human and humbler light makes for an enjoyable and thought-provoking read. Whether the reader is looking for an accessible guide to the major breakthroughs in science or a nuanced general history of science, The Upright Thinkers is a fine starting point. Jia Hui Lee is a graduate student at Massachusetts Institute of Technology. His research focuses on olfaction and odors. He tweets @zooanthrosmia. Read more reviews by Jia Hui Lee.